Text to Speech Software free download. The new innovative Text to Speech Software is very easy to use. Some years ago, a computer software was introduced that altered the meaning of transcription. While we only knew how to create a text version for materials, there was a need to start creating voice versions (conversions) of text. The result is the Text to Speech Software that we have today. 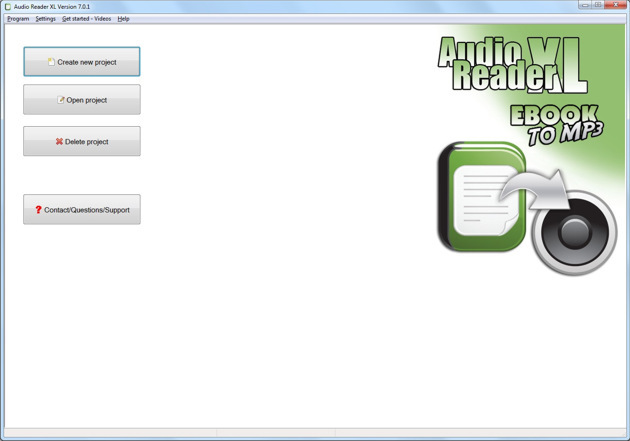 Also called Text to Speech Software, it is a voice reader software that converts text into a voice output. The Text to Voice Software can also be better described as a kind of speech synthesis that receives text, converts it to sound, and releases it as spoken words. It has been with us for some time now and is available in different forms on different online platforms. And in case you're wondering if you need it and why to stick with me as I walk you through everything you need to know about the TTS Program or Text to Speech Software. Text to Voice software - People with Learning/Reading Disabilities Another group of people who will find the Text to Speech very useful is those who may have difficulty learning the traditional way. It could be as a result of dyslexia or any other disability. Perhaps, the issue could be an inability to read large volumes of text. A Text to Voice reader software is just the way to go. People who can Speak, but can't Read the Specific Language with TTS Program Again, there are those who can speak a certain language but may not be able to read it. By using a Text to Speech software, this group of people will be able to just listen to the text and understand it. This will help to break language barriers that may occur when a person is trying to derive meaning from a second language. People who Desire a Different Style of Learning whit a TTS-Software These Text to Speech Software are also a great necessity for people who just want a different method of learning. Truth is, there are different kinds of learners and different ways to learn, whether it's auditory, visual or kinesthetic. This TTS technology has helped to provide a solution for people who will learn better by listening. People who Multitask with Text to Speech=TTS) Multitasking is something we all do at one point or another. You may not be able to actually sit down and read text from your device. You can easily use your voice Text to Speech Software to listen to the content. It is even easier if you're using a mobile device. You can plug your ears with a headphone and listen on the go with the text to voice reader. Text to Speech Software comes with a lot of benefits. While there are several providers of this software online, it is important that you only look out for the best that provides great clarity and affordability. This is especially important if you're a web owner or content producer. It will definitely help boost your online traffic, help more people get your message, and provide enormous conversions. It has never been easy for computer users to let read aloud a PC text from a computer. But now, thanks to this TTS Reader, that is a thing of the past. Users simply have to mark any text and copy it into the TTS Reader and they can create a MP3 audio file from it with just one click. Therefore, it is also very easy for users to make ebooks from audiobooks or to translate texts for study, with this TTS Reader to then recite them on the way to school or to work from an MP3 player or mobile phone. Maybe you just have not realized how useful such a Voice Aloud Reader can be for you. What are you waiting for? Download the Voice Aloud Reader and you will see what you have missed so far without realizing it. So far, you may have thought such a Voice Aloud Reader is only for people with visual impairment, but actually, such a program makes everyone's life easier. The uses of such software are simply too diverse to list here. It can be very helpful to have his hands free now and then and let the computer read texts. In the future, for example, you can have your emails read to you in the evening and start cleaning up your home. This saves valuable time that we all have too little these days. Even some students learn easier, if he does not read texts himself, but can listen to the texts. Here and now you can download for free our Voice Aloud Reader and try out for yourself! Are you considering using text to speech software? Would it make life easier for you when you need to use the computer? There are many products available in TTS programs; you can even get text to speech software free download versions of some products. Text to voice programs can make life easier if reading text is time consuming or tiring or if you have barriers to reading text. Who uses text to voice software? A wide range of people, busy businessmen and women who need to prepare for meetings and don't have the time to read all their paperwork and thus get a voice reader to read it to them as they do other things, visually impaired people and people with other reading difficulties, who find a text to speech software handy to quickly tell them what documents and programs say, students who want to revise for exams, and people who get tired and don't want to go on staring at a screen when they can have the contents read out to them, and people who take information in better by hearing than by reading . Those are some examples of people who use text to voice programs. 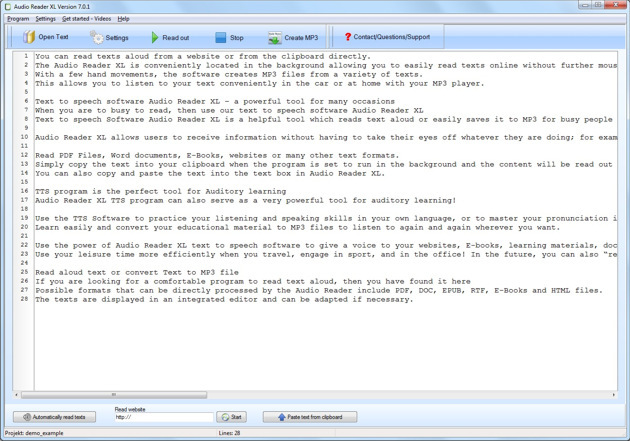 If you are looking for good TTS software, look no further than Audio Reader XL for all your text to speech software needs. The easy text to speech software of Audio Reader XL is ideal for anyone new to using text to voice or who is looking for a simpler text to voice program. The software reads text aloud, simply and clearly. It can be used with web pages, emails, ebooks and more, it can even be used to create MP3s. The reader can process most kinds of text files including ePub, Doc, PDF, HTML RTV and others as well as text on the clipboard. The reader can be set to automatically read text files if required but can also read selected files with just one click of the mouse. The text to speech software Windows version is currently the only version, with text to speech software Windows 10 being the most up to date version of Audio reader XL. The program also runs on Windows Vista, XP, 7 and 8 for PC. The option to convert texts to MP3 files gives you the freedom to listen to the files on the move and where and when it suits you, making this text to speech software a competitive and popular choice for those who need text converted to speech. The MP3 feature means that you can revise material for meetings or exams while in the car or on the train or even at the gym, just by listening to the converted files. This is easy to use and competitive simple text to speech software if you are searching for something to make life easier for you by having the text read out to you rather than straining to read it. The program is very user friendly and simple, as well as versatile to read a wide range of texts or convert them to MP3 so that you can listen to them at your leisure and when you can give them your best concentration. Imagine not having to spend hours scrunching up your eyes and getting headaches trying to concentrate on documents and feeling that in the end you took very little in, instead you just listen to them at the gym and on the way to work or school and you can remember a lot of what was said. If that is what you would like, then you have found the right text to speech software. This text to speech software includes a variety of language in which the texts can be read, including German, Spanish, Italian and the primary language, English. Other languages can be added. 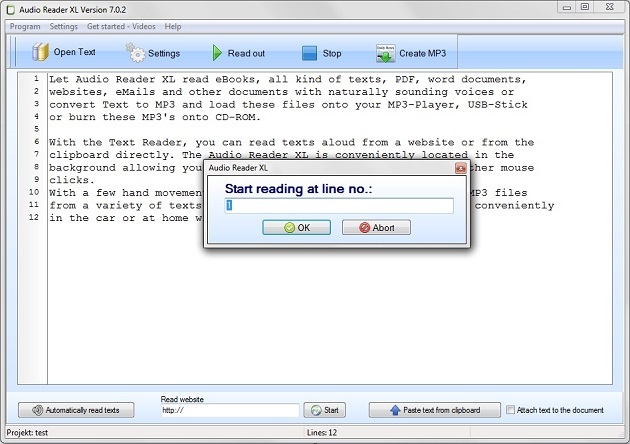 Audio Reader XL is a multilingual text to speech software, and adapts to other languages. Audio Reader XL is safe and easy to download and install, you can get it installed and start using it straight away, no more missing out on favorite ebooks, no more struggling to revise for exams or prepare for meetings, just install, click and whatever you need reading out to you is read-out. Audio XL text to speech software is an ideal choice for anyone who needs assistance in reading documents, books or any kind of text. It's worth a try.